GST is the abbreviated form of Goods and Service Taxes which is an indirect tax that is levied whenever a customer buys any goods or services. GST is a comprehensive indirect tax on manufacture, sale, and consumption of both goods and services which aim to replace all other indirect taxes by the Central and State Governments of India. GST will bring all the taxes under a single umbrella which will eliminate the cascading effect of taxes on production and distribution of goods and services. Hence, GST is of utmost importance. What do you think about GST? The importance of GST is as mentioned below. First and foremost, GST would help in the reduction in the overall burden of taxes on the goods as per the consumers’ point of view. This is a significant step to reform the system of indirect taxation in the country. The integration of numerous taxes of the Centre and the State would help in the diminishing of the double taxation which would lead to a national market that would be common for all. The reduction in the prices is another important part of GST since the traders and the manufacturers would not have to include any taxes as a component of their production cost and would result in the reduction of the prices. Not only decline in the prices, but GST will also help to reduce the tax as a whole since the companies will have to pay only the tax on value addition which is currently being paid on the entire value of the product or the service. GST being a uniform structure of taxation will ensure faster and cheaper movement of goods throughout the country which in turn will help to boost the growth of GDP of the country. One single tax means compliance at a low level and reduced procedural cost. The load to maintain compliance would be reduced significantly and also the compliance would be very efficient. Most importantly, GST will ensure more transparency in the overall taxation system which will help the growth of GDP to the center, states, manufacturers, industrialists, the common citizens and the country as a whole. Another importance of GST is that it will significantly help in the reduction of avoidance of tax. The preference of purchase with invoices will be common among all the distributors since that would provide them with better margins of profit as the distributor would be getting the credit for all the taxes that are paid at the preceding stages. GST will help to remove the bias based on the location since it will have even tax structures across different states eliminating the location bias. Taxes should become a hindrance in the path of investment, and hence GST will help to boost investment without the worry of tax difference in the states which will ultimately result in the growth of business in the areas that are underdeveloped. One of the greatest importance of GST is the creation of a unified market. Due to GST, the taxes imposed by the center and the state will be cut down which would result in the formation of a unified market that would enhance the interstate movement of goods with a drop in the costs of business. GST will help to increase the revenues in the state by the expansion of the base of tax which will eventually lead to the increasing of the revenues available at the disposal of the center and the state. This would be immensely helpful for increasing the resources of the states that are poor. GST is extremely useful in the improvement of the governance of taxation. This enhancement is made primarily in two ways that are as follows. The first one is related to self – policing incentive which is inherent to value – added tax that can work very powerfully in GST. The second one relates to the structure of dual monitoring of GST, one is by the center, and the other is by the states. Thus, it can be very well understood that GST helps to bring transparency and eliminate corruption in the administration of taxes. This is done by the removal of all the present shortcomings of the supply chain due to the presence of several layers of policies. 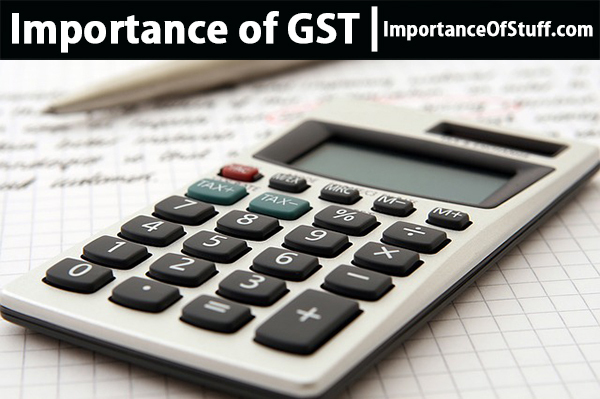 GST is not only friendly to the investor or the business, but it is also equally favorable to the consumer as well. GST is actually of utmost importance to the country that has the capability to benefit all.